I love sweet and sour chicken. I think my love is really just in the sweet and sour sauce to be honest. Every time I go out for a night on the town, I MUST have chicken nuggets. The limo driver for my bachelorette party was even nice enough to pull through Micky D’s so I could indulge in my absolute need for chicken nuggets and sweet and sour sauce. Truth be told, I would be totally ok with just licking the sweet and sour sauce of the nuggets and tossing them. You can only imagine my elation when I found this recipe. 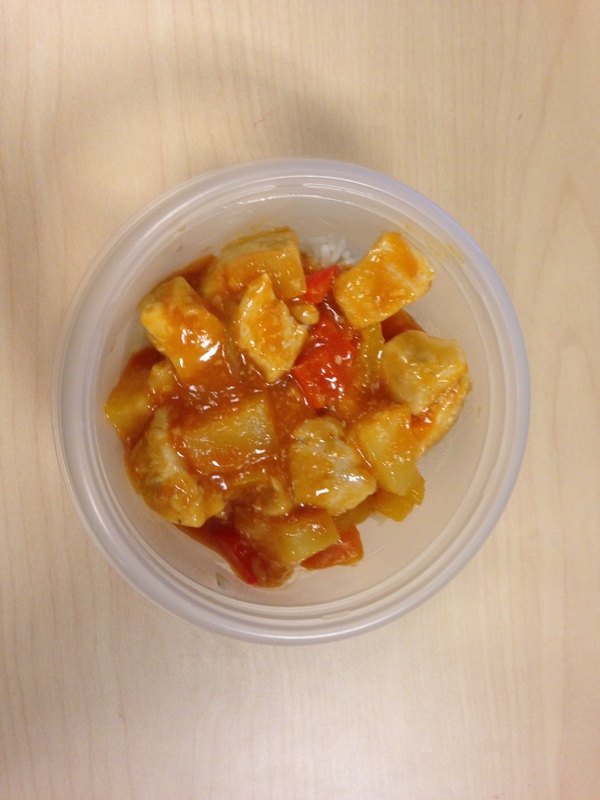 Sweet and Sour Chicken made at home! I’ve tweaked the recipe a bit to fit my lifestyle and that is what I am going to post here because the original recipe is actually two recipes. I made this this week because the chicken was only $1.99 a pound and the peppers were only $1.99 a pound (both usually at least 1.00 more!). I’ve also figured out that this is about 325 calories a serving (6 servings). 1. Toss the cubed chicken, cornstarch, and egg white together in a bowl to coat the chicken. Allow this to sit while you cut and cube your veggies and make your sauce. 2. Whisk together all ingredients of your sauce except for the cornstarch. Set aside. 3. Turn large pan on high heat and add oil. Coat the bottom of the pan and allow the oil to heat up. Cook chicken so all sides are browned. The middles may still be pink, you are going to let them cook more later. Set the chicken aside. 4. Add the extra oil to the pan and add veggies. Add ginger. Fry for 1 minute. Add pineapples, and HALF the sauce to the pan (keep other half reserved). 6. While this is cooking, whisk together the cornstarch and remaining sauce to make a slurry. Add this when the chicken is almost done. Stir in the remaining sauce and allow the sauce to congeal a bit. Serve. I served this over white rice. You could use brown rice or a rice noodle or a pasta, but I used white rice. My husband really enjoyed this. This was one of the first recipes I used when I started to become domestic we started dating. I have also used green peppers when the fun colored ones aren’t on sale and it came out very yummy too. You can add carrots and celery or any veggies you like in your meal and it should have good results.